SouthGate’s Soojungwa Hot Toddy derives its inspiration from a classic post-dinner Korean punch made of cinnamon and ginger and topped with pine nuts. The cocktail version features bourbon and a housemade syrup infused with cinnamon, ginger, brown sugar, and star anise. Cheers! We have officially reached the final stretch of winter. March 20 marks the first day of spring, and for many of us, that's reason to celebrate. However, before looking ahead to warmer temps, why not give winter a proper send-off in these (hopefully) last few weeks of chilly weather. How? With a bar crawl dedicated entirely to drinks of the season, of course. We've devised a plan that'll take you to spots across the city where you can sample and savor warming hot cocktails in their final days on the menu. In between, you'll make a pit stop at Blue Cross RiverRink Winterfest for a little ice-skating fun and house-made hot chocolate. Order the cocoa spiked if you want to maintain the theme of the day or virgin if you need a little booze break. As you prepare to embark on this cocktail tour around the city, be sure to gather some friends to join the adventure. Warm-spirited drinks are steeped in a rich history of being enjoyed communally. The first records of such spirits begin with mulled wine, dating as far back as the ancient Romans, who fondly shared the drink over gatherings and meals. It was also attributed to good health and happiness, a sentiment that spread widely across Great Britain during medieval times, when mulled wine was once considered healthier than water. Speaking of health, though not a remedy we'd suggest today, the hot toddy, too, was once popularly believed to promote well-being. By the mid 19th century, doctors were regularly prescribing the spiced drink as a cure for the common cold. In the event those health claims hold even an ounce of truth (does the placebo effect count?) and to "counteract" the wear and tear of any good bar crawl, the hot toddy will serve as an end note to our Philly winter cocktail excursion. Enjoy the nightcap first at SouthGate, where it comes in a Korean-inspired version. Then head to Fishtown's Lloyd Whiskey Bar, where there are two antidotes from which to choose — the classic hot toddy and the Penicillin, a smoky, citrusy version of the toddy with Laphroaig scotch and orange peel. Whether you ambitiously try to hit all the stops below or pick and choose your favorites, get ready to sip and savor the final weeks of the season. Plenty Cafe’s Chocolate Kick uses homemade ganache, steamed milk, espresso liqueur, and vodka to create a spirited take on hot cocoa. Our bar crawl begins in East Passyunk, where the bartenders at Plenty rise early on weekends to whip up drinks for the brunch crowd. Enjoy a breakfast or lunchtime bite as you delve into your first hot cocktail of the day. Choose between the Fireside Chat and the Chocolate Kick, which are both on the sweeter side, making them an appropriate starter option if you're kicking things off early. The first is a hot apple cider spiked with dark rum from local BlueBird Distilling, along with Cappelletti Aperitivo, which lends hints of bitter orange flavor. The latter is Plenty's take on spiked hot chocolate, combining espresso liqueur with homemade ganache and steamed milk and finished with local Stateside Urbancraft Vodka. The Hot Jawn, Bing Bing Dim Sum’s take on a hot toddy, features Domaine de Canton, a ginger liqueur that raises the warming effects of the cocktail. Wander a few blocks north of Plenty on East Passyunk Avenue, and you'll hit Bing Bing Dim Sum, an energetic and colorfully decorated spot serving small, Chinese-inspired plates. It opens at noon on weekends, when you can venture in for an early-afternoon Hot Jawn, made with bourbon, ginger liqueur, honey, and lemon. With mild hints of spice from the ginger, it's an excellent pairing for the dumpling, curry, and noodle dishes on the menu. Be sure to order one or two of those to savor as you sip. Unwind post-skate at Blue Cross RiverRink Winterfest with a house-made hot chocolate, available spiked with spirited options, including peppermint and vanilla vodka. As you are now two cocktails deep, it's time to decide whether you'd like to take a little booze break or keep the warming momentum going. At Blue Cross RiverRink Winterfest, take time out from bar hopping and spend a while on the rink or hit the arcade for a dose of old-school fun. Afterward, cozy up by the firepits with a house-made hot chocolate, which can easily be spiked upon request with whiskey, rum, or flavored vodka options, such as vanilla or peppermint. The Magnificent Decadence at the Franklin Bar, set afire before serving, is made with a house rum blend, cognac, falernum, butter, brown sugar, vanilla, and spices. From Winterfest, head to Center City. The first stop is the Franklin Bar, a chic spot known for its well-curated cocktail menu, including two hot options. The Magnificent Decadence is made with a special house rum blend, cognac, falernum, butter, brown sugar, vanilla, and spices; this flaming, eye-catching creation is from bartender Ian Adamczyk, formerly of the Windy City. "Hot buttered rum is a staple in the dead of Midwest winters. We used to make it in giant batches, heating it from the bottom and lighting it on fire on the stovetop to brown the butter and bring out the richness of the rum, brandy, and spices," Adamczyk says. "As it turns out, the technique works when executed in a glass, too, which creates both a unique look for the drink and a decadent flavor for a cold night." The other option at the Franklin is the Last Place Called Home, a tart, apple-forward cocktail that tastes like hot cider. It combines Calvados apple brandy with herby Sicilian Averna liqueur, along with sage, demerara sugar, and lemon. The Love’s hot buttered rum cocktail serves as a rich, boozy dessert drink. Less than a block away, newly opened the Love has several options. The classics include a take on the hot toddy as well as whipped-cream-topped Irish coffee. For something slightly more unusual, try Jorgen's hot buttered rum, a rich drink with Jamaican rum, whole milk, and a hot buttered rum batter made from spices, butter, and vanilla ice cream. "To me, there's nothing like finishing a big meal with a boozy dessert drink when it's cold outside," says head bartender Jorgen Erikson, who makes big batches of the drink for friends and family each season. SouthGate’s Soojungwa hot toddy takes its inspiration from a classic post-dinner Korean punch made of cinnamon and ginger and topped with pine nuts. The cocktail version features bourbon and a house-made syrup infused with cinnamon, ginger, brown sugar, and star anise. Walk off the first few drinks with a 10-minute stroll on 18th Street until you reach the corner of Lombard Street, the next stop on your cocktail tour. There, find SouthGate serving its signature Soojungwa hot toddy, inspired by a Korean dessert punch made from cinnamon and ginger. "Some Korean restaurants bring it to your table after dinner as part of the meal, and so we wanted do something creative with it by turning it into a toddy," says owner Peter Hwang. "It's a bit herbal and earthy with ginger and anise and also has sweetness from a touch of brown sugar." The drink combines two ounces of bourbon with hot water and a house simple syrup made from cinnamon, ginger, brown sugar, and star anise. It's topped off with pine nuts before serving. If you're up for a nightcap in a laid-back, living-room-like setting, catch a ride to Fishtown's Lloyd Whiskey Bar, where craft cocktails are served until 2 in the morning. 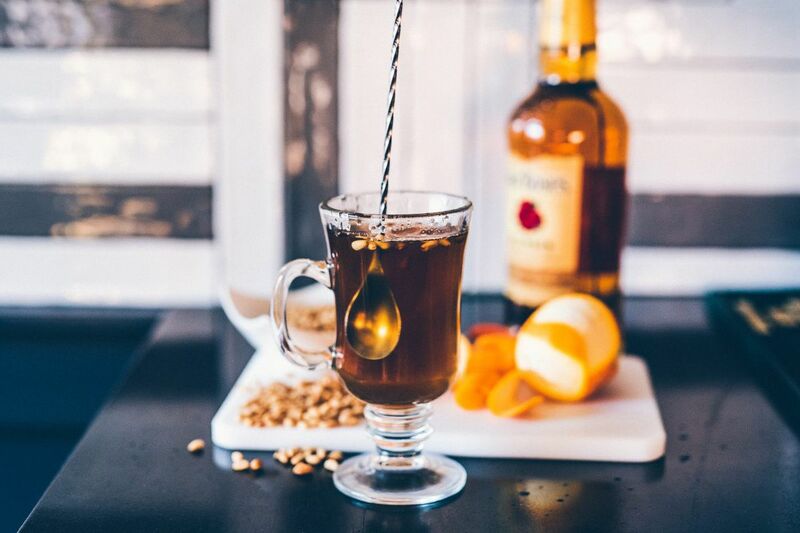 It offers a hot toddy made with Bushmill's red bush Irish whiskey, and a drink called the Antidote, made with blended scotch, honey and ginger syrups, fresh lemon, and a Laphroaig 10-year rinse. It's finished with an orange twist, which owner Scott Coudriet notes is designed to complement the rich smokiness of the Laphroaig whiskey. Pick your antidote and call it a night.